One of the most cosmopolitan of all the Greek islands. Alpha Yachting offer motor yacht, sailing yacht, bareboat & catamaran charters as well as day trip cruises from Mykonos to tour around the island or for Greek island hopping tours to Naxos, Paros, Syros, Tinos ect... We offer a wide selection of motor yachts, sailing yachts available for charter to suit all budgets and needs. If you have any questions on chartering a yacht in Mykonos just CONTACT US for more information on our available yachts, charter rates, or itinerary suggestions. Mykonos has an international reputation and quite justifiably attracts a large number of tourists from all over the world. 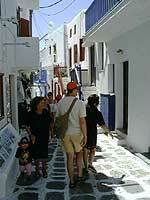 Amongst them many intellectuals and well-known artists prefer Mykonos for their vacation. Next to Dilos (the financial center of ancient Greece) and 88 nautical miles from Piraeus lies the island with its beautiful white houses, narrow paths, many churches and wonderful beaches. Gray-green rocks girt with prickly pear bushes and plains covered in wild flowers, the occasional white-washed plaster of a rural house, a little church or a windmill are characteristic features of the Myconian countryside. Here the high mountains encountered in most of the Cycladic islands give way to small rocky hills which combine with beautiful beaches to make up the landscape of the island. Mykonos harbour - There is a new marina under construction which has not been completed yet. The old harbour of Mykonos yachts are no longer permitted to tie. The marina offers some shelter but at the present moment is still under construction. Water is not available yet but fuel is via mini tankers. Provisioning available in town. Ormos Ornos - This bay is located on the South side of Mykonos. It offers good shelter from the meltemi. The best place to anchor is at the head of the bay. There are several tavernas ashore. Ormos Ag. Annas - This bay also offer good shelter from the meltemi especially to the to the east there is a small cove. The beaches in this area are nudist beaches. Superb beaches, all with wonderful golden sand, such as Super Paradise, Agios Stefanos, Psarou, Kalafatis, Platys Yialos, Ornos, Elia and Panormos are there waiting for all who adore the sea. The night life in Mykonos is greater than any other island of Greece. Especially in summer, clubs, discos, bars and pubs are always full with people.Night clubs and beach bars exist all over the island. Every summer Mykonos has many famous visitors and VIPs like artists, fashion industry people, politicians, sportsmen, actors and other celebrities from all over the world. You can find schools for wind surfing and water-skiing in Psarou, Platys Gialos and Kalafatis, while Ftelia is ideal for wind surfing meetings, because of its south orientation. On the way to Platys Gialos and Kalafatis and Ornos there are scuba diving schools. water sports at a lot of beaches of the island and play tennis. 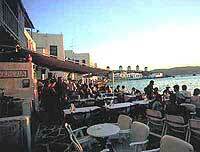 About Mykonos - Mykonos Greece: Information about the island of Mykonos with many pictures.